Greek MPs are debating new proposals sent to the country's creditors with the aim of getting a third bailout and averting a possible exit from the euro. The plans contain elements, including pension reforms and tax rises, that were rejected in a referendum called by Prime Minister Alexis Tsipras. The EU and other creditors are studying the plans before a summit on Sunday. France and Italy welcomed the proposals but Germany, Greece's biggest creditor, warned of little room for compromise. The Greek parliament began debating the plans late on Friday, with a view to voting on them in the early hours of Saturday morning. Mr Tsipras told MPs that his party was being forced to take measures that were not in its programme - but said voters last Sunday had not authorised an exit from the euro. He admitted his government had made mistakes during its six months in office, describing its struggle with creditors as a war. "Now I have the feeling we've reached the demarcation line," he said. "From here on, there is a minefield." With Greece's banks running out of money and its economy facing implosion, European leaders are spending the weekend in emergency talks over the debt crisis. On Saturday, eurozone finance ministers meet under the Eurogroup - a forum for discussing monetary policy - to address the Greek plans. A meeting of eurozone heads of government is scheduled for Sunday afternoon, followed by a full EU summit two hours later. EU leaders seem divided over the Greek proposals so far. German finance ministry spokesman Martin Jaeger said Germany saw "very little leeway in terms of restructuring" Greece's debt and would not accept any reduction in debt that caused Germany more losses. He said Finance Minister Wolfgang Schaeuble remained "sceptical"
French President Francois Hollande said the new proposals were "serious and credible" and that the "Greeks have just shown their determination to remain in the eurozone"
Eurogroup head Jeroen Dijsselbloem said the Greek proposals were "thorough" - but warned they would have to be fully reviewed. If approved, the proposals must also be ratified by parliaments in several EU member states, where they may be challenged. Only a few days ago Mr Tsipras won an overwhelming mandate from the Greek people, in a referendum, to reject more-or-less these bailout terms. And today, on the back of that popular vote, he is signing up to the supposedly hated bailout. This is big politics that would make Lewis Carroll proud. But here's the point. 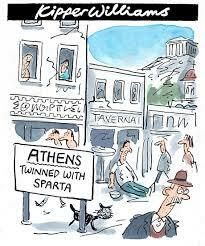 If a way isn't found to allow the banks to reopen within days - and the ECB simply maintaining Emergency Liquidity Assistance won't come anywhere near to achieving that - the Greek economy will implode so that any bailout deal agreed this weekend will become irrelevant in weeks. Haircut: A reduction - or writedown - in the value of a troubled borrower's debts. In 2011, Greece's private lenders received a massive 50% haircut of what they were owed. At this stage the Greeks are being careful not to ask for debt haircuts. Debt restructuring or rescheduling: Altering the terms of a loan in order to extend the repayment period. It may also mean dismissing part of the money owed. US Treasury Secretary Jacob Lew has said Greece's creditors should restructure the country's debt, but that such a move would not necessarily mean writing off a part of what Greece owes them. The IMF's boss Christine Lagarde has also said Greece needs debt restructuring. Debt relief: The forgiveness of part or all of a debt (a "haircut"), or the temporary suspension of repayments on the existing debt. The IMF Chief Economist Olivier Blanchard has said any Greek deal should include debt relief. How easy is it to swap currencies? Meanwhile, the plans face possible opposition in Greece for having embraced many of the austerity measures rejected at a referendum last Sunday. Earlier, a spokesman for Mr Tsipras' Syriza party said he was confident MPs would give the government the mandate to negotiate the new bailout package. The coalition government has 162 seats in the 300-strong parliament, and also has the backing of many opposition MPs. However, the BBC's Mark Lowen in Athens says that Mr Tsipras has made a major climb-down. Media captionShould Greeks turn to Bitcoin? Mr Tsipras has asked eurozone and other creditors for €53.5bn ($59.47bn) to cover Greece's debts until 2018. He submitted the proposals to Greece's creditors - the European Commission, the European Central Bank and the International Monetary Fund - by the Thursday deadline they had set. Greece's creditors have already provided more than €200bn in two bailouts since a rescue plan began five years ago. The second bailout expired on 30 June. Greece's banks are still closed and the €60 (£43; $66) daily limit on cash machine withdrawals for Greeks, imposed on 28 June, remains in force. With a shortage of €20 notes, for many the limit is in effect €50.